A GPS is a great navigation tool. Among others things it can tell where you are on hearth which was the main concern for earlier navigators of the Spanish and Portuguese navies, until reliable navigation tools such as the sextant were invented. Land navigation and exploration was also the province of the sextant; it was used in the jungles with an artificial horizon (a separate glass case containing mercury), and the star to drop down was the sun, as the readings were taken during the day as tree canopy made night reading almost impossible. Today a small gadget called GPS can do the same for us in only a few minutes. The tool can give us our position on a map using Latitude and Longitude, UTM, military grid, or user grid. It can do this during the day or night, with clouds or storm, best of all the GPS can fit even in a small pocket, the new units are more accurate than ever and can pin point your position with an accuracy of a few feet. This position can be plot in a topographic map if you have a latitude/longitude ruler or even eyeballed, if the map is provided with a UTM grid or military grid. Most new topographic maps now are provided with an UTM grid (Universal transverse Mercator) which is based on the metric system. In this system the latitude is measured in meters north or south of the Equator, and the longitude from meters from the center of a zone, of course the names change and the longitude is called Eastings and the latitude Northings. In our map you can see an X named start and another X named finish. The place marked finish is where we left the quads on the side of the trail to climb up to Blenheim Hill early that morning. The purpose was to check the creek for trout and scout the area adjacent to the top of the hill. The reading on the GPS for the place where we left the quads, was 4.700.200 meters North (you use the margin of the map scale) and 541,100 meters East from zone 18 (you use the scale in the top of the map). The first two numbers are the Zone and do not count as meters. As we had spent two days using the GPS on others locations the gadget was getting very low on battery juice, so we decided to navigate by compass and save the batteries to take readings of the position of interesting places only. By the end of the day and very tired we found ourselves near the unimproved road that lead to the road next to the cemetery. A reading of our position with the GPS using the UTM system indicated that we were 4,700.000 meters north of the Equator and 539,400 meters east of the zone 18, (see how easy is to count meters in the 1,000 squares with the tick’s marks in the margin of the map counting for 100 meters each). Tracing a line from start to finish and measuring the degrees with the compass (used as a protractor and disregarding the magnetic needle) gave us a direction to go 80 degrees and 1700 meters for distance, (but the GPS already told us that). The trek was on okay -terrain slopping downhill and we had to be careful with our footing only in the last 350 meters downhill to the quads. The other option was to take the road going to the one near the cemetery (1300 meters) walk on that road passing by the ruins of the School until the next trail left (1900 meters) and walk uphill about 1,000 meter to the quads, a total of 4,200 meters. In a heavy forest with no landmarks and not elevation to take triangulations readings with a compass, it is impossible to know where you are, the GPS can give you your exact position day or night and you can plot that position in the map using the Universal Transverse Mercator grid. You can do that also with the Longitude and Latitude, but you have to prepare your map (with a different grid) and have a latitude and longitude ruler to measure your position. As GPS’s are easily adjusted for the UTM grid, it is the most convenient and easiest to use of all the grids. In this explanation we have used the three tools to complement each other, the map, GPS and compass, and demonstrated that finding a road at the end of the day, it is not the shortest route for traveling to your destination; it also demonstrated that you don’t have to be glued to your GPS (as I see many people in the woods doing) to get your money worth out of the gadget. New here, but figured I have something to add. Great write up! As has been said before a compass does you little good if you don't either have a great understanding of the lay of the land or a map and the ability to read it. I took a guide course about 10 years ago when guiding was the direction I thought I would go and one of the things they did was drop us off in the woods, have us hike to a ridge or hilltop and give us 5 min to declinate from 3 points and figure out where we were on the map and then figure the best route to a final destination point. One time we were on a hill top and the clouds started to descend. A storm was coming and literally we had 3 min to figure out where we were and how to get to a backcountry hut as we didn't have tents/bags. We found our way to the hut in a whiteout blizzard. 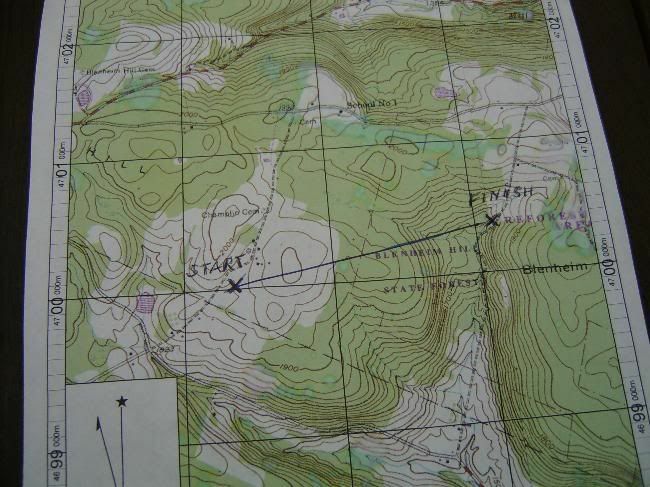 That sort of challenge taught me well the skill of reading a map and using a compass. GPS units are great, but sometimes they are wrong and need calibrated. It's wise to take along a compass to check your GPS readings if on a long outing in unfamiliar country. There are validated instances of GPS units being wrong and getting people lost. ive always used a compass thanks to the scouts and gramdpa but i do have a gps, but batteries fail! the state land i used to hunt has a lot of iron ore in it,so a compass isnt that reliable! SHOOT WHEN YOU CAN ,TRACK WHEN YOU MUST , THEN FRY SOME GAME !! And yes to the power of the new phones. It amazes me, the things they can do. I don't have a smart phone, is is a dumb phone but I can talk to it. Are you a squirrel hunter, by chance?